The royal house of Monaco used its Facebook page to announce that Princess Charlene is expecting a baby. The news of an heir for Monaco was accompanied by a photo of Charlene with Prince Albert that went viral in minutes. Prince Harry was a social media star on May 29th as he visited the Suffolk Show but Clarence House chose a super cute photo of the prince helping a little girl make pizza to post on its Instagram site. Princess Mette-Marit took centre stage in an image on the Norwegian Royal Family's Facebook page as she attended the Stockholm Food Forum on May 26th 2014 and met up with Prince Daniel of Sweden while she was there. The Duchess of Cornwall tucked into some cakes on her visit to the Bath and West Show on May 28th 2014 - as seen on Clarence House Instagram. It's the news that Monaco has been waiting for. As their third wedding anniversary approaches, Prince Albert and Princess Charlene have announced they are expecting a baby. The child will be first in line to the throne and give the principality its longed for heir. The baby is due before the end of the year although no further details of Princess Charlene's pregnancy have yet been announced. The couple were last seen in public at a dinner in Monte Carlo on May 26th but there was no hint of a pregnancy announcement being imminent. The news comes on the 70th anniversary of Albert's grandmother, Charlotte, renouncing her rights to Monaco's throne in favour of her son, Rainier, and the day before the 91st anniversary of Rainier's birth. The Duchess of Cambridge carried out her first public engagement since her return from the royal tour of Australia and New Zealand on May 29th 2014 when she and Prince William visited Scotland. But while the Earl and Countess of Strathearn - as they are known in Scotland - carried out a whole range of duties it was one unguarded moment that really caught the imagination. Kate seemed so taken with a gift of a kilt wearing teddy for Prince George that she was momentarily lost for words. Prince William was pretty impressed as well as he popped over during a walkabout to have a look at the bear which was kitted out in the Streathearn tartan. The Queen attended the first royal garden party of the summer which was held at Buckingham Palace on May 21st 2014. Also present were the Duke of Edinburgh and Princess Beatrice of York. Earlier in the week, the Queen had visited the Chelsea Flower Show - she is Patron of the Royal Horticultural Society. 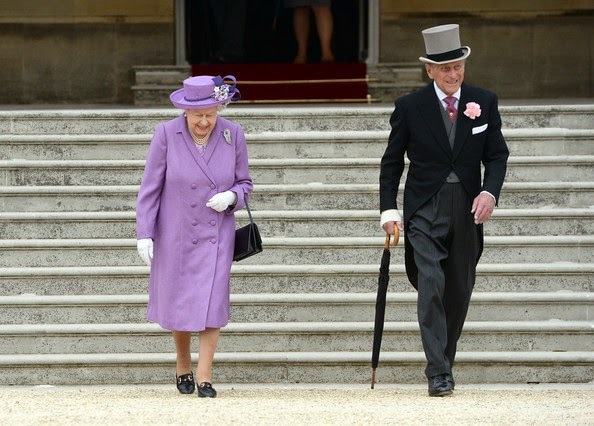 The Duke of Edinburgh accompanied her. On May 20th 2014, the Queen was in Portsmouth where she visited HMS Lancaster, inspected a Guard of Honour and had lunch with the Ship's Company and their families.